Along with a potential record wet season for the Top End, the best since 2011, the year 2017 has brought us the latest edition of the great North Australian FISH FINDER book. This book started in the NT and is still the undisputed Barra Bible for fishing remote northern Australia, especially around Darwin. It is a must if you are chasing the Territory’s Million Dollar Fish, which was 100 x $10,000 tagged barra in 2017/18. This great promo is likely to run again in 2018/19. As well as revealing where the best reefs, rockbars, wrecks and ramps are, this huge book of fishing maps and data gives readers chances to win Lowrance HDS9 units, Berkley portable outboards, and more. 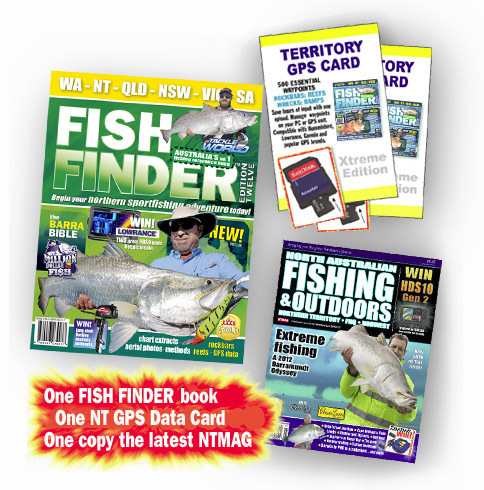 Get a copy at www.fishfinderbooks.com if you want to take advantage of the various barra pack deals, or grab a copy at your local newsagent or tackle store.